Vassals of the Mongol Empire for more than two centuries, the Russians learned from their conquerors by carefully studying their military tactics, and eventually grew strong enough to use what they had learned to win victory after victory against their former overlords, eventually opening the way to the formation of the Russian state. Founded by Genghis Khan, the army of the Mongol Empire emerged as one of the most modern military machines in human history. Tight organization, iron discipline, refined tactics and powerful weaponry honed the Mongol nomads into a deadly menace for the peoples of Asia and Europe. True pioneers of the art of war, the Mongols were besieging fortresses with artillery 100 years ahead of the Europeans. Even in the absence of communication and supply lines they could quickly mobilize and equip large bodies of troops, move thousands of kilometers and attack seemingly out of nowhere. These children of the steppe also deftly mastered the construction of warships, and their fleet came perilously close to conquering Japan in the late 13th century. Forcing the Chinese Empire to its knees, the Golden Horde stormed through Central Asia to seize the Transcaucasus and ancient Rus, extending its might as far as the Adriatic Sea. Of all the peoples subjugated by the Mongol hordes, the Russians proved most able to adopt the tactics of the invaders while drawing bitter lessons from their own mistakes and heavy losses in battle. In 1223, Mongol chieftain Genghis Khan used a feint withdrawal to dupe and obliterate the armies of the Rus princes on the Kalka River in the present-day Donetsk Region of Ukraine. In 1238, the cavalry of Batu Khan outflanked, surrounded and annihilated Russian forces on the Sit River (in today’s Yaroslavl Region). And in 1377 the Mongols used their superior reconnaissance abilities to fix their enemy and smash Russian units on the Pyana River (in the Nizhny Novgorod Region). To resist the Mongol onslaught the Russians had to master the same reconnoitring moves, cavalry fighting tactics and setting of ambushes. And from the 14th century onward the Mongols also began to suffer some defeats as the Muscovite princes turned the tables on them. 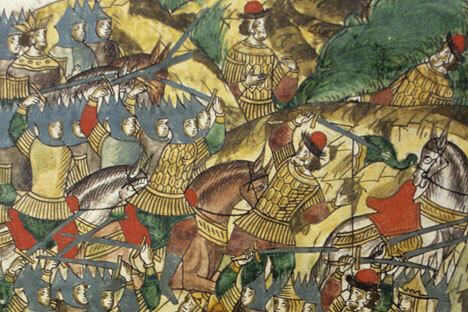 At the battle of the River Vozha (in today’s Ryazan Region) in 1378 the army of Dmitry Donskoi adopted a Mongolian arc formation and lured the enemy into a pincer movement before destroying them. Two years later the Mongolian forces suffered their worst ever defeat in the Battle of Kulikovo, beaten again by their own tactics in the form of a concealed ambush. But the Mongols did not only teach the Russians to fight. Over the centuries they went on to form distinctive units of the Russian army themselves. The irregular Tatar cavalry embodied the fighting traditions of Genghis Khan’s horsemen and sowed terror among the Tsar’s European enemies. During the Livonian War in the 16th century, Ivan the Terrible’s commanders won many battles against German, Polish and Swedish forces using rapid raids and cavalry charges and the Tatars’ unique forward and rear-guard actions to grind down the enemy. In the 18th century Peter the Great famously reorganized the Russian army along European lines but chose not to meddle with the light cavalry, a vital asset born of the military tradition of the East. The Tatar light horsemen evolved as mounted shock forces which then became a feature of most European armies prior to the 20th century. Riders armed with long cavalry lances were invaluable in mounted combat, able to unseat an opponent with the lance at full gallop and finish them off with a sabre. The Tsar had good cause to admire the nomads’ fighting qualities, and so the first Russian Lancer regiments were formed from Tatar horsemen from the Black Sea steppe. In the 1709 Battle of Poltava, against the hitherto invincible Swedish army, the Kalmyk cavalry of the Lower Volga repulsed a powerful attack by regular infantry and then counter-attacked to smash the Swedish flank. The Don Cossacks also adopted and refined Tatar fighting techniques while living side by side with them. Napoleon’s army learned firsthand of the fighting skills of the steppe people during the invasion of Russia in 1812. Beyond tactics, the physical appearance of the Russian warrior and his weapons also bore a marked resemblance to that of the Mongols until the military reforms of Peter the Great. The first sabres were brought to Russia in the 10th century but only saw widespread use after the Mongol invasion. It was the perfect weapon for the horseback rider, light and easy to wield and good for backhand blows to both mounted and dismounted enemies. By the 15th century the sabre had almost completely supplanted the traditional sword in Russia. The bow also became one of the Russian soldier’s most indispensable weapons. Russia was the only European country to widely use the saadak, the mounted archer’s classicarmament, consisting of a taut bow held in a sheath and a covered quiver of arrows. The saadak was not just a weapon and also served as a status symbol in Russia, as it had done in Mongol culture. All Russian tsars before Peter the Great were known to have a specially decorated saadak among their finery. While once a key transplant from Mongol military practice to the Russian army. The cavalry has now receded in the annals of history. But one Mongol military tradition flourishes to this day in Russia and worldwide: the cry of “Hurrah!” Drawn from the Mongolian root “ur” meaning “hit”, it still echoes down the centuries from the thundering charges of Genghis Khan’s horsemen.